We expect the businesses we go to every day to be safe and welcoming. For the most part, these spaces are safe, yet accidents can happen, and they may be the result of negligence by property owners or employees. In such cases, it’s important to discuss the incident with our White Plains, NY premises liability lawyers. The legal team at Worby Vecchio Edelman, LLP would like to consider some of the most common causes of slip and fall accidents. We’ll also note how simple it is for property owners to address these hazards. When there’s any liquid or moisture on a linoleum, tile, or hardwood floor, the risk of a slip and fall accident is. quite high. The same is true when a floor has recently be waxed or polished. Any spills need to be addressed by employees as soon as possible. Similarly, slipper hazards should be marked with a simple “wet floor” sign to help prevent injuries from occurring. Rain and snow have been a pretty regular occurrence this year. That means people brining in dripping umbrellas and tracking in moisture from outside. That could make floors slippery, wet, and the source of injuries. 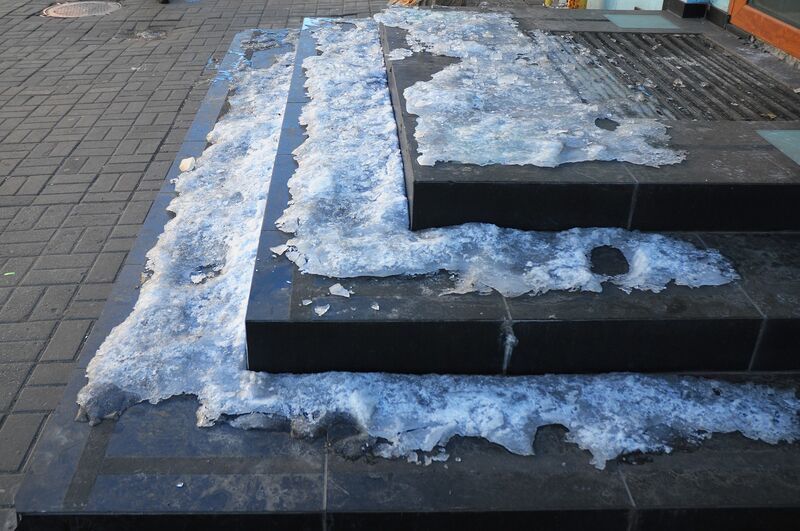 Snow by entrances or on stairs is also a major hazard. Having absorbent mats at entrances, umbrellas bags, or an umbrella basket can help limit slipping hazards. Employees should also dry mop floors periodically to keep them free from liquid, and shovel snow by entrances as well. A piece of tissue paper or a fallen ball bearing may not seem bad, but even these small objects can throw off your balance and affect your footing. Whenever there’s random debris on the floor, it needs to be picked up and discarded as soon as possible to make sure everyone at the property is safe. Snags in carpet, broken tiles, peeling linoleum, and a host of other flooring problems pose a number of issues. While this never looks good to visitors, the more important problem is the risk of slips and falls. Any damage to the floor needs to be fixed in a timely manner to prevent injuries to visitors/customers. Extension cords are sometimes necessary in order to clean a property or simply to make sure certain objects at a property run properly. When these cords are exposed, however, it can lea to tripping hazards for people at the property. Having floor cord covers is a simple option for preventing potential injury. When a floor is uneven, the risk of a trip or fall goes up. You may miss a small ledge or a sudden platform on the floor, causing you to lose footing and fall over. This danger is pronounced when it comes to stairs, as one can imagine. It’s important that floor be even, and that any sudden rises or dips be visible and obvious. When a stairwell, stairway, or ledge lacks a rail of any kind, the risk of a potential fall is much greater. It’s important that properties have such simple safety measures in place since they can mean the difference between accident prevention and a severe injury. Lighting at a property is such an important part of visitor or customer safety. If a bulb or fixture is out, the poor visibility makes accidents more likely. This is especially important when it comes to stairways and ledges. Property owners need to make sure that bulbs are always changed and properly working. Wear and tear to a property can really take its toll, resulting in a number of unsafe conditions. To keep people safe, its important that regular maintenance be performed on a building. It can make a major difference to overall safety. To learn more about your legal options following a slip and fall accident, be sure to contact the lawyers of Worby Vecchio Edelman, LLP. We will discuss the nature of your accident and offer expert legal guidance through the litigation process.